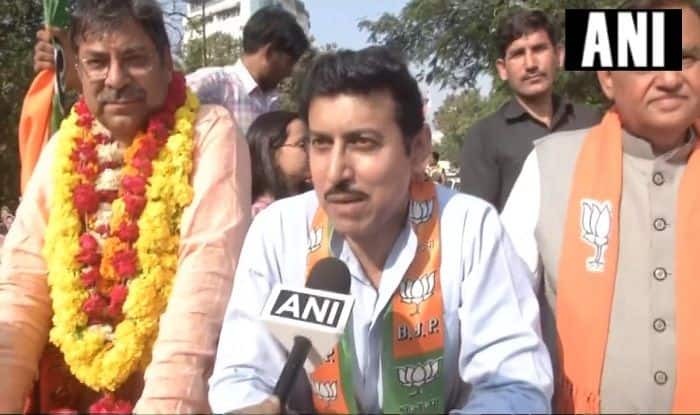 As Rahul Gandhi visits Rajasthan, Union Minister and BJP candidate from Jaipur, Rajyavardhan Rathore asks: 'People of Rajasthan want answers from him on why his ‘hate for PM Modi’ is turning into Congress’s hatred for the country.' Union Minister Rajyavardhan Rathore attacks the Congress government in Rajasthan for not providing farmers relief under central schemes started by the Narendra Modi-led government. As Rahul Gandhi visits Rajasthan, Union Minister and BJP candidate from Jaipur, Rajyavardhan Rathore asks: ‘People of Rajasthan want answers from him on why his ‘hate for PM Modi’ is turning into Congress’s hatred for the country.’ Union Minister Rajyavardhan Rathore attacks the Congress government in Rajasthan for not providing farmers relief under central schemes started by the Narendra Modi-led government.